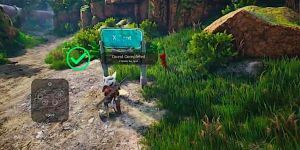 BioMutant In-Depth Gameplay Video | Nerd Much? The quest here is called "X Marks the Spot," and your character does just that. There isn’t much in this gameplay video for BioMutant that we haven’t seen before. Coming from GameSpot at PAX West, it shows all the same areas, and enemies that we saw in the last gameplay video. There are some new dialogue pieces, but they do not reveal anything new about the story or plot of the game. During the last minute or so of the video, we see an opening to a new area called Spot Spot. The quest here is called “X Marks the Spot.” And your character does just that, by taking a piss on the sign reading “X Spot.” Clever and not a little ridiculous. A little further up the road and we see a three-headed beast with red fire and large teeth. All the better to to eat the player with. I also noticed that when opening chests and such, you can view the stats on the weapons and equipment right away. Though I didn’t see if there was an option to compare the new gear to what you currently had equipped before you pick them up. Other than all that, seeing the footage the second time around just emphasizes how still in development this game is. The animation on the main character has way too much clipping and general visual glitches that need to be cleaned up. The textures are also quite rough, though that might have something to do with GameSpot’s video quality. All of the voice work isn’t done either, I noticed a sharp clip of a phrase being cut off before the voice was actually done speaking. Despite all of this, I am very much look forward to this game. BioMutant looks a lot of fun. My favourite feature so far is the art style, of course, and the combat. It seems the guns are used not only to cause some damage but to stun with specific abilities. In this video, it was Zap (electricity) that very handily stunned the smaller enemies for quite a while. See it in full in the link below.